In the heart of a glacier carved basin, amid snow-capped mountains and undulating terrain sits Lake Wanaka. My home for the next 7 days. Queenstown’s lesser known neighbour, the region has been designated the world’s first Lifestyle Reserve. 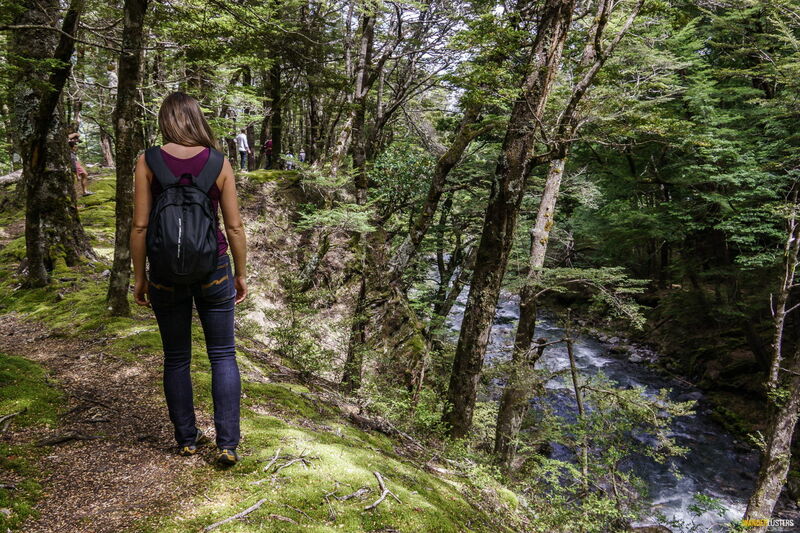 Offering both residents and visitors the chance to explore the surrounding landscape on their own terms, Wanaka combines outdoor living with a hearty serving of adventure. 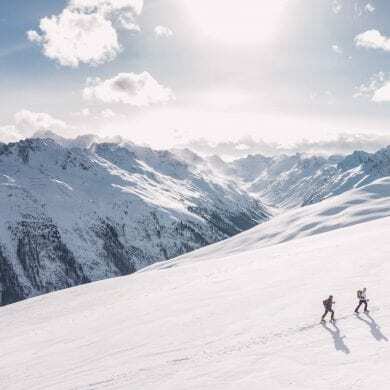 Away from the overcrowded tourist trail that weaves its way south from the international hub of Christchurch, the town plays host to adrenaline junkies keen to avoid the hustle and bustle of the South Island’s adventure capital Queenstown. Despite the wealth of activities on offer which afford the chance to explore the lake edge; mountain biking, horse riding, hiking and tramping, I am drawn to those that incorporate aquatic adventure. Since arriving in Wanaka I’ve watched the changing skies reflected in the lake, seen sunsets paint the glacial water with swathes of pink and orange and watched as the North West winds agitate the water into a stampede of white horses. Today the world is still. The surrounding landscape is mirrored perfectly in the surface of the lake as though a parallel world exists beneath the water. 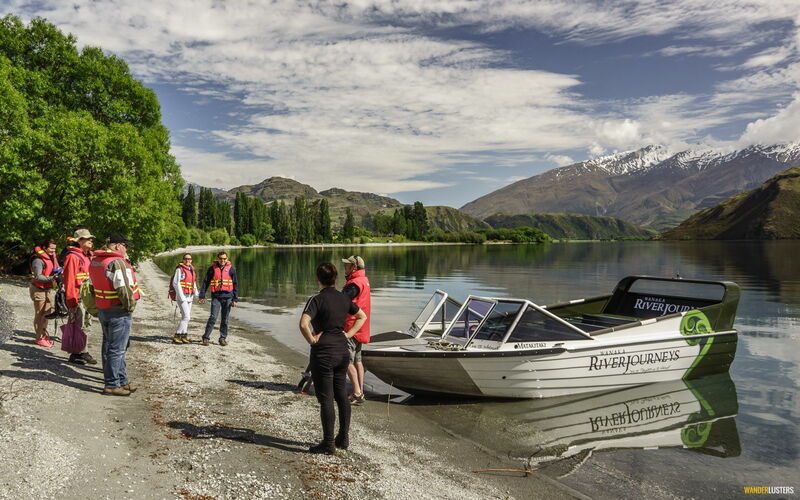 Today I’m joining the crew of the Wanaka River Journeys Jet Boat Tour, a wilderness escape that incorporates high speed thrills with the chance to explore some of the region’s most isolated landscapes. My guide zips up my life jacket and smiles; I can see that he is eager to get out on the water. 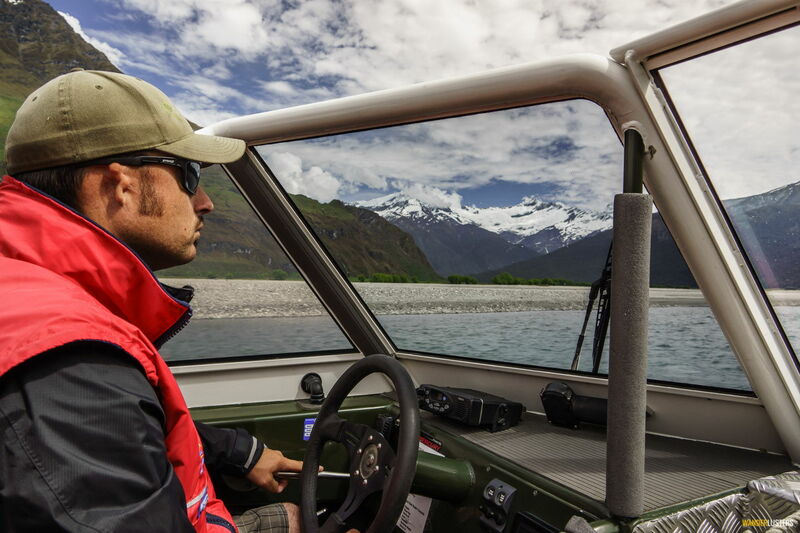 Leaving the vast expanse of Lake Wanaka behind we head into the mouth of the Matukituki River. Flowing for over 30km and fed by the glaciers of neighbouring Mount Aspiring National Park the river is a temperamental beast rushing down a wide glacier craved valley. It is up through this valley that our River Journeys guide is navigating. Full throttle we fly across the top of the water, like a race car the boat accelerates until it feels as though we are levitating just inches from the surface of the river. Suddenly the guide raises he right arm and signals that he is going to spin the boat. I brace myself on the side of my seat as we fly 360 degrees in a mass of white water and spray. The sudden change of momentum sends waves crashing over the bow and encourages a few shrieks of excitement from my fellow passengers. The guide stands and jovially begins to count heads making sure he’s still a full set of clients onboard. I laugh and look towards those sat at the rear of the boat, the windscreen sheltered me from much of the spray but they appear to have received a thorough soaking. An ever changing eb and flow the Matukituki River is constantly evolving, weaving its way through the valley from the glaciers high above to Lake Wanaka below. Navigating the river takes skill but more importantly unless you’re on foot, it takes a jet boat. With the water just a few centimetres deep in numerous places, conventional vessels are unable to explore the vast wilderness of the Matukituki valley. Propelled by a jet of water omitted from the back of the craft a jet boat operates on the surface of the water, not underneath like those that use propellers. This allows for the ultimate in adventurous river exploration. Following the route carved out by Mother Nature our guide watches for changes in the rushing water and decides on the best path to follow. The rushing current and visible river bed dictate to him the safest route which he appears to follow with ease. A slalom course which twists and turns, the river is just one of the natural elements on display. Either side of the water a landscape of varied greens, hues of mauve and earthen tones paint a picture. Flat pastures boarder the water and behind them mountains loom large, their peaks clad in snow. Stepping off the boat and onto the muddy river bank the world around me is on a scale that dwarfs the boat and its crew. Towering mountains stand proud in the distance and a vast expanse of grassy flatland stretches out in front of me. As I walk out into the field our guide talks passionately about the history of the area, it’s place in Maori heritage and the micro-climate that exists in the valley. A short walk over grassland and we arrive at McGill’s Creek, a forested gorge with trees clad in vibrant green moss and a fresh water creek with water so clean I couldn’t resist the urge to fill my bottle and drink. Following the line of the creek along a narrow path bordered by weathered rock brings me to a waterfall, the sound of which is so soothing I find myself drifting into a haze. The forest is captivating and despite having explored for around 30 minutes, I’m a little disappointed when the guide calls everyone together to return to the boat. Despite the high speed fun and River Journeys’ informative guide, the real thrill for me was the chance to explore such a remote landscape. 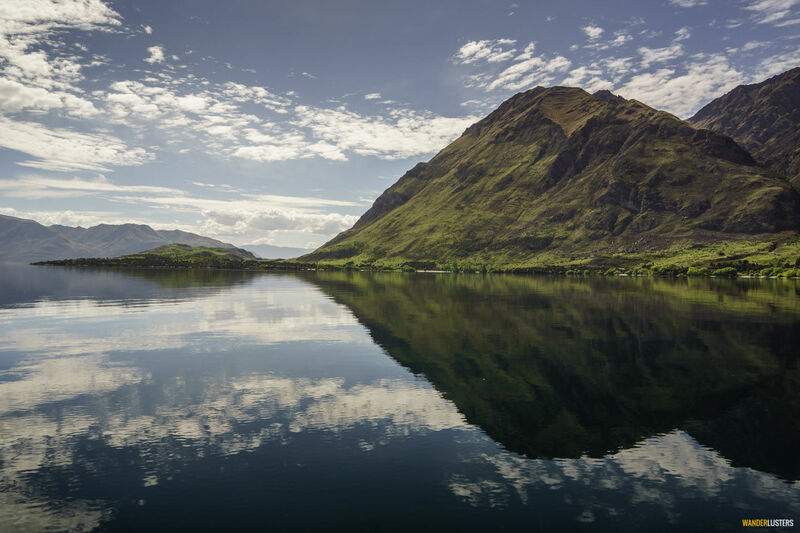 The striking peaks of Mount Aspiring National Park, the lush flatlands home to grazing stock and the clear waters of the shallow river are a soul soothing combination. My mind wandered throughout the trip to thoughts of Maori chefs and hunting parties making their way along the river banks in search of the rich bounty swimming in its waters. 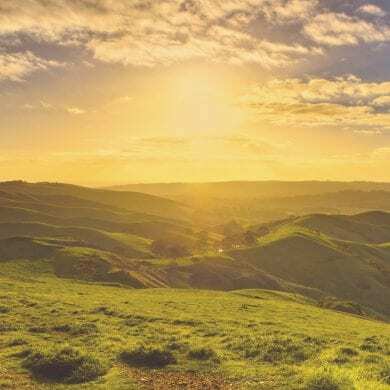 This alpine landscape inspires thoughts of rural living and a simple existence, and you should be warned that there’s the possibility the trip will insight the desire to head out on some of the Matukituki Valley’s tramping tracks for a little rural retreat. 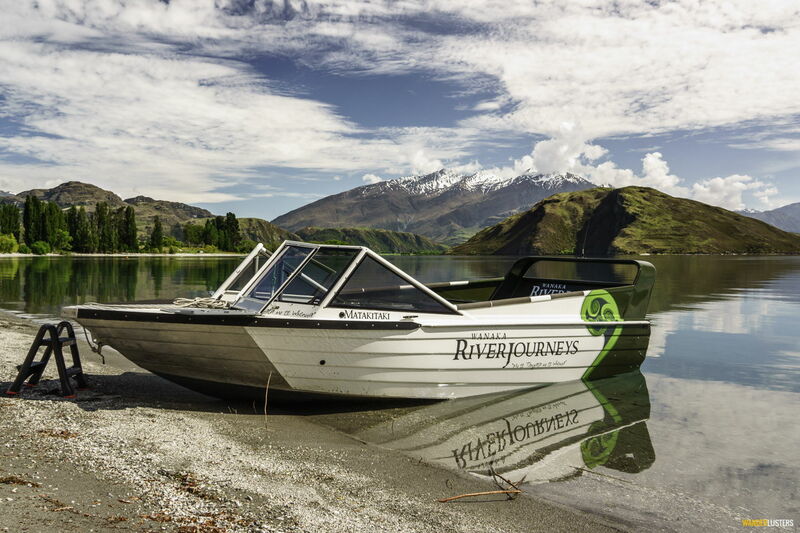 For those with a limited time frame to explore the Queenstown Lakes region I highly recommend joining the crew of Wanaka River Journeys for their engaging half day jet boat tour. 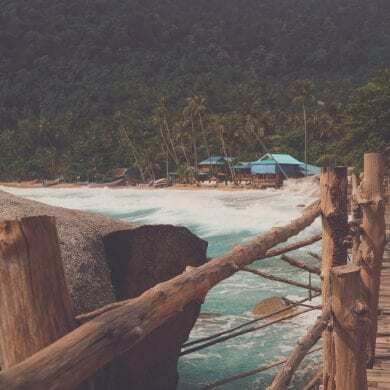 The perfect way to escape the reality of human influence for a few hours the trip will inspire you to head out on your own wilderness adventure and … potentially buy a jet boat too! Have you explored the Matukituki Valley on your own river journey? Share your comments with us below. Stunning pics of a stunning place Charli! I have been following along with your journey through NZ on Instagram and loving it. I will be making my way to the South Island in July and hopefully this will include the Wanaka area as it looks amazing. Great stuff Jen! We’ll watch out for your updates. Give us a shout if you’re after any recommendations. We’ve spent the last 6 months down here exploring and have so many favourite little spots! I would love to ride a jet boat there…how gorgeous! Your photos are stunning; I love the way they pop! The reflections are beautiful. Thanks Corinne! The reflections were like watercolours, so fluid. I hope you get to see them for yourself one day! Amazing photo! It looks like you had a great trip- I would love to experience the remoteness of New Zealand. Thanks for sharing! It’s just so awe inspiring, each twist and turn uncovers a new landscape. I hope you make it here too Bridget! I have to agree with you there Catherine, there’s something so exciting about exploring the natural world. Especially one on the mighty scale of the Milford Sound! Sounds like we’ll have to head to Wanaka if we visit the South Island. It’s interesting – the scenery is so much like British Columbia where we live (we’d probably feel right at home on the South Island). We’ve visited the North Island, however. The Bay of Islands captured our hearts. You’ll have to make sure you explore down south if you ever return to New Zealand. While the north has it’s own charm, we too loved the Bay of Islands, the south has landscapes that are on such an enormous scale that they seem to immerse you to a much greater extent in the natural world. sounds like fun trip and i must admit your pic of the mountain reflecting against the lake really captures the beauty of the south island! Cheers Steve, it can be a tough call when deciding where to spend time as you explore the south of New Zealand. There’s just so many great landscapes to explore! Wow, that’s something absolutely stunning! Some photos bring back great memories from Lhasa – the capital city of Tibet – the same sky and crystal clear water! Thanks for your comment Agness! The reflections on the still water of the lake were just beautiful! Guys…this looks fantastic. When I hear “river tour” I think fancy cruise ships or rickety wooden hulls, but this is something totally different. From the looks of it, the landscape is breathtaking. Sign me up! Thanks J.R !! I have to say I’m of the same opinion, the phrase ‘river cruise’ conjures images of pensioners on a paddle steamer sipping cups of tea! this was nothing like that! so much fun! !